After the 1864 completion of the Peninsula Railroad connecting Escanaba to the iron mines of Negaunee, maritime commerce in and out of Escanaba exploded as vessels loaded with ore left the growing port headed for the hungry steel mills along the shores of the eastern lakes. Departing Escanaba, and heading for the open waters of Lake Michigan, vessels were forced to thread their way through a chain of islands which spread themselves across the entrance to Green Bay between the Door and Garden peninsulas. Traffic setting off to coast the north shore into the Straits took the more northerly Poverty Island Passage, while vessels bound for the southern ports of Lake Michigan took St. Martin Passage between St. Martin Island on the west and Little Gull Island to the east. St. Martin Island was a wooded and hilly island approximately 2 ¼ miles in length by 1 ¼ miles in width, tapering gradually at its southeast end until it disappeared beneath the waves. However this disappearance was deceptive, since the island continued just beneath the surface for an additional 1 3/8 miles, with St. Martin Island Shoal sitting 1 mile yet beyond the end of the spit. In order to guide mariners through the passage, and to warn them of the shoals lurking just beneath the water, the Lighthouse Board requested an appropriation of $15,000 for the construction of a Fourth Order Light Station and fog signal on St. Martin Island in its 1891 annual report. After Congress chose to ignore the request, the Board felt strongly enough about the necessity of the station that it reiterated its request in its reports for the following seven years. Congress finally responded with the requested appropriation on July 1, 1898, and a survey party was dispatched from Chicago to identify the best location for the station in September of that same year. Selecting an area on the island's narrow southeast point, information on ownership was obtained from the General Land Office, and negotiations to obtain title began. As was often the case, the owners of the land did not wish to sell, and since work on the station could not proceed until clear title had been obtained, the matter rested in the courts until free title was finally obtained in 1901. The District Engineer immediately began drafting the plans and specifications for a unique iron tower for the station, and proposals for furnishing the required metal work were invited. The required minimum of three competitive bids were received, however all three of them were well in excess of the amount allocated for the tower portion of the project. Thus, it became immediately apparent that material costs had escalated significantly over the ten years since the original cost estimates were drawn-up, and that the station could no longer be built within the amount of the 1891 appropriation. After evaluation, the Board requested an appropriation of an additional $14,000 in its 1901 annual report, bringing the total requested funds for the station to $29,000. While Congress balked at the request for $14,000, an act was passed on January 28, 1902 appropriating $10,000 for the project, for a total appropriation of $25,000. Bids for the tower iron work and fog signal plant were advertised, and a contractors selected for their supply. However, as a result of significant raw material shortages, the contractors broke the bad news that they would be unable to supply the important iron components until some time the following year. Without the tower, it made no sense to commence construction, and the project was put on indefinite hold until the iron work was in hand. With the delivery of the fog-signal boilers on September 2, and the iron work for the tower on September 5, 1903, a work party and the materials were delivered on St. Martin Island, and construction began. By the time the onset of winter caused the abandonment of construction for the season, the two-story duplex keepers dwelling was standing to the level of second story joists, the boathouse was complete, the concrete footings for the fog signal had been poured, and three log cribs had been constructed and placed to form the outer end of a boat landing. At the opening of navigation in 1904, the work party returned to the island and resumed construction. Over the following months, the full complement of the station's buildings took shape. As was frequently the case, the station's structures were duplicates of successful designs used previously at other stations in the district. The two story Cream City brick duplex keepers dwelling was built to the same plan as previously used at Plum Island in 1897, and the cream city brick fog signal building housing duplicate 10-inch steam whistles used the same plan as those previously constructed at Old Mackinac in 1890 and Beaver Island in 1891. A standard brick oil storage building rounded-out the station's complement of support structures. The St. Martin Island tower was built to a unique plan, never to be duplicated anywhere else on the lakes. Hexagonal in plan, it was exoskeleton in design, consisting of six steel vertical corner structures into which flat iron side panels were riveted. Likely as a result of the lessons learned in the construction of the Sturgeon Bay Canal tower in 1903, the attachment of the tower to the foundation was buttressed with iron lattice work to help eliminate wind induced vibration. At the top of the main tower structure, the flat side plates were replaced by curved sections, creating a circular watch room with porthole-style windows just below the gallery. A round cast iron lantern with diagonal astragals was centered in the gallery, containing an occulting Fourth Order Fresnel lens illuminated by a 24,000 candlepower incandescent oil vapor lamp. The rotating lens assembly was outfitted with flash panels of white and red, which when rotated at the correct speed was designed to provide the station's characteristic 10-second repeated cycle consisting of a red flash of 0.2 seconds, an eclipse of 4.8 seconds, a white flash of 0.2 seconds followed by and eclipse of 4.8 seconds. From the foundation to the top of the ventilator ball atop the roof, the tower stood 57 feet, with its location on the island providing a focal plane of 84 feet, and a range of visibility of 17 miles in clear conditions. 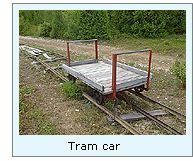 Finally, since the boat landing was so far from the station buildings, an iron-tracked tramway was constructed between the two to allow for the easy transportation of supplies from the landing to the station. Construction at St. Martin Island was completed on June 15, 1904. However a shortage of government funds precluded the hiring of keepers to man the station until the opening of the navigation season in 1905, and during that first year of operation the station's keepers fed 13 cords of wood to the boilers to keep the 10-inch team whistles wailing for a total of 110 hours. 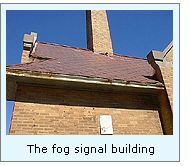 At some time prior to 1939, the 10-inch steam whistles were removed from the fog signal building and replaced with a diaphone fog signal. During this time period the station was also electrified, and telephone service run to the station. At a yet to be determined date, the light was automated through the installation of a 190 mm acrylic lens, and the Fourth Order Fresnel was shipped to Point Iroquois Light Station, where it can be seen to this day displayed in the fine museum in the keepers dwelling. After automation, the St. Martin Island structures were boarded-up and abandoned to the elements, save for infrequent maintenance visits by Coast Guard crews. Today, the entire island is under private ownership, with the area around the lighthouse controlled by a Native American tribe. While boarded-up, the structures on St. Martin have fared much better than those on nearby Poverty Island, which have been completely abandoned, and have thus succumbed to years of ceaseless vandalism. Click Here to see a complete listing of all St. Martin Island Light keepers compiled by Phyllis L. Tag of Great Lakes Lighthouse Research. We have yet to visit this light station, and since the entire island is now under private ownership, it is unlikely that we will be able to find an opportunity to take close-up photographs of the historic light station structures ourselves. We wish to take this opportunity to thank Larry Bell for kindly offering to share his photographs of the station taken during his jet ski visit to the island in September of 2001. With the Island under private ownership, visitors to the island are discouraged in order to dissuade vandalism. We are presently unaware of any specific boat tours which pass the Island, and thus the best chance of getting a glimpse of this station would be from offshore in your own vessel, or possibly from a charter service out of Marinette, Wisconsin or Menominee, Michigan. US Army Corps of Engineers. 12/04/01 email from Larry Bell.